CES 2018: B&O Play announces flagship wireless headphones | What Hi-Fi? The Beoplay H8i (above left) and Beoplay H9i (above right) launched alongside new all-black and all-white versions of the E8 wireless headphones. B&O Play has announced two new flagship headphones at CES 2018: the Beoplay H8i and Beoplay H9i. The company has also announced all-black and all-white versions of the E8 wireless headphones it launched last year. 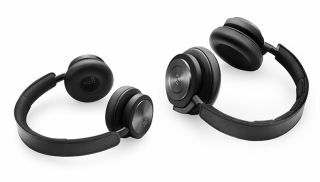 Both new headphones have a raft of new features to tempt the headphone-hungry, including proximity sensors (that will turn off your audio when they detect you've taken them off) and a one-touch transparency mode( so you can hear your surroundings more quickly). The company has also added dual-device connectivity so you can pair the headphones - via Bluetooth - to both your smartphone and your tablet or laptop simultaneously. Battery life has also been improved: the H8i have a claimed 30 hours of life, more than double that of the H8, while the H9i can get 18 hours from a single charge. There are a few new individual features to the headphones too: the H8i has physical buttons instead of the, ahem, "mesmerizing [sic] touch control" (their words, not ours) of the H9i. The H9i also apparently have improved sound quality, thanks to a bass port that "ensures optimal and more powerful bass", and active noise-cancellation has been improved to better cancel human voices. The two headphones will launch on the 25 January, in 'natural' and black colour schemes, at £350 for the H8i and £450 for the H9i. Win Monitor Audio's Silver 200 AV12 speaker package!